We are now an official imprint of Brooklyn Arts Press! We couldn’t be happier about this new collaboration and the innovative and beautiful books we look forward to bringing into the world as part of the Brooklyn Arts Press family. As BAP’s imprint, Augury Books will continue to publish two new books each year under our name. In fall of 2018, we are excited to publish Fruit Geode by Alicia Jo Rabins, and we will open for submissions for our second book beginning January 1st. We’ll be looking at poetry, short story collections, and creative nonfiction so if you have a manuscript you’ve been polishing up, we’d love to read it. Augury Books’ editorial board remains the same. You can continue to reach Founding Editor Kate Angus, Associate Editor Kimberly Steele, and Assistant Editor Nicolas Amara at augurybooks@gmail.com or through Augury’s social media accounts. Our back catalog books will continue to be available through Small Press Distribution (SPD), in bookstores, on Augury Books’ website, and on Amazon. Arisa White is a lover, a wordsmith, a connoisseur of real life in all its hues and shades, ups and downs, smiles and cries of joy and sadness. She does not promote herself as an authority on matters of perfection in finding love, being in love or holding on to love. But her poetry certainly gives a crispy clear picture of the immensely rich world the author embodies. To read more of the feature, and to learn more about HocTok, you can visit their website. Next Wednesday, June 1, from 7:00-8:30pm, Pen and Brush will host its most recent reading from their curated series “Pen and Brush Presents…” with Augury’s Carey McHugh representing Augury Books. Other readers will include Laura Sims (Ugly Ducking Presse) and Jennifer L. Knox (Bloof Books). Admission is free and open to the public. Refreshments will be served, and copies of books will be available for purchase and signing. We hope to see you there! Jennifer L. Knox is reading on behalf of Bloof Books. The New York Times Book Review wrote that her new book, Days of Shame and Failure, “hits, with deceptive ease, all the poetic marks a reader could want: intellectual curiosity, emotional impact, beautiful language, surprising revelation and arresting imagery.” Jennifer is the author of four books of poems; her work has appeared four times in the Best American Poetry series as well as The New York Times, The New Yorker, American Poetry Review, McSweeney’s, and Bomb. She teaches at Iowa State University. Carey McHugh‘s poems have appeared or are forthcoming in Boston Review, Denver Quarterly, Gulf Coast, and Tin House. Her chapbook Original Instructions for the Perfect Preservation of Birds &c. was selected by Ray Armantrout for the Poetry Society of America’s 2008 New York Chapbook Fellowship. She lives and works in Manhattan. She is reading on behalf of Augury Books. Laura Sims is the author of Staying Alive (Ugly Duckling Presse, 2016). Her first book, Practice, Restraint, was the winner of the 2005 Fence Books Alberta Prize, and in 2006 she was awarded a US-Japan Creative Artists Fellowship. In 2014 she edited Fare Forward: Letters from David Markson, a book of her correspondence with the celebrated experimental novelist. Her poems have recently appeared in Black Clock, Colorado Review, Denver Quarterly, Eleven Eleven and Gulf Coast. Sims has been a featured writer for the Poetry Foundation’s Harriet blog, and a co-editor of Instance Press since 2009. She teaches literature and creative writing at NYU-SPS. Laura is reading on behalf of Ugly Duckling Presse. This reading series is curated by Kate Angus for Pen and Brush (www.penandbrush.org). For over 122 years, Pen and Brush has been the only international nonprofit organization offering an outlet for women in both the literary and visual arts in the city of New York. Each year, volunteers from across the country dedicate thousands of combined hours to perform an arduous task: we manually, painstakingly tally the gender disparity in major literary publications and book reviews. We break down thirty-nine literary journals and well-respected periodicals, tallying genre, book reviewers, books reviewed, and journalistic bylines to offer an accurate assessment of the publishing world. We were not surprised to find that men dominate the pages of venues that are known to further one’s career. The VIDA Count, annual since 2010, has not only effected change in the publishing industry, but has also created a strong community of writers and advocates who stand with us. There is much more work to be done. If you’re unable to donate to VIDA, please consider sharing their project with others, or even volunteering. Augury’s Founding Editor Kate Angus has been hard at work on her debut book of poems, forthcoming from Negative Capability Press on June 1. We would love to see you at her launch party on Friday, May 6th at Pen and Brush. Details are below, and more can be found on the Facebook event. Pen and Brush: 29 East 22nd Street, between Broadway and Park Avenue. There will be complimentary wine and snacks, followed by a reading of So Late to the Party. Advance copies of So Late to the Party will be available for purchase. Sarah Lawrence College recently announced an exciting collaboration with Mayapple Center for the Arts and Humanities, an arts retreat outside of New York City whose focus on sustainability and mindfulness they hope to bring to a weeklong intensive on creative social transformation. The first workshop, which will take place from June 12-June 19, 2016, is titled ““How Can Artists and Scholars Respond to Climate Change?” and will offer concentrations in Visual Arts, Poetry, or Music, with opportunities to work across disciplines. The program will culminate with an exhibit, reading, and performance showcasing students’ work. For more information on the program, tuition, and how to apply, head over to Sarah Lawrence’s Center for Continuing Education & Professional Studies. Big Other‘s recent blog post entitled “Most Anticipated Small Press Books of 2016” features three Augury names among a body of work recently published by independent presses. Arisa White‘s you’re the most beautiful thing that happened, Sara Schaff‘s Say Something Nice About Me, and Augury Editor Kate Angus’ So Late to the Party were all mentioned on the list. Head over to Big Other to read about these and many other titles to look for this year. 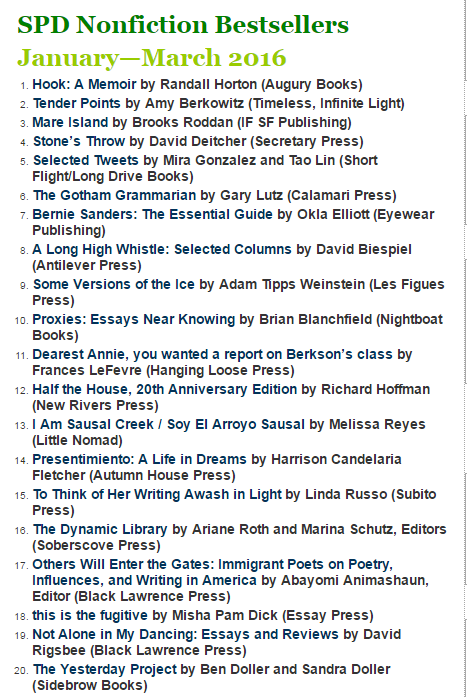 Small Press Distribution recently released their January-March 2016 Bestseller List, with Randall Horton’s Hook taking the #1 spot among many great small presses. Hook can be purchased through Small Press Distribution via Amazon. Xavier Review is Accepting Submissions! Xavier Review, of Xavier University in New Orleans, is currently accepting submissions for forthcoming issues. All submissions are welcomed, but the magazine has historically devoted itself to discovering writers interested in the American South, New Orleans, the Gulf and Caribbean sphere, African American culture, ethnography, and religion. Recent issues include work from Rodney Jones, Salgado Maranhão, Laurie Filipelli, A. Loudermilk, Julia Story, Gregory Lawless, and others. All submissions, comments, and questions should be sent to Ralph Adamo at radamo@xula.edu. On Monday, April 11, 2016, join Augury Books for a launch of Alicia Jo Rabins‘ Divinity School at Unnameable Books in Prospect Heights. The event will begin at 7pm, featuring readings by Rabins as well as Augury authors Joe Pan, Frances Justine Post, and Augury’s founding editor, Kate Angus. All are invited for a night in celebration of literature and good company. See the Facebook event for more information. Alicia Jo Rabins is a poet, composer, musician, and Torah scholar. She was born in Oregon and grew up in Baltimore and New York City. Alicia’s poems appear in Ploughshares, American Poetry Review, 6×6, The Boston Review, and elsewhere. She teaches ancient Jewish texts to children and adults and performs internationally as a violinist and singer. Alicia lives in Portland, Oregon with her husband, daughter, and son. Joe Pan is the author of two collections of poetry, Hiccups (Augury Books) and Autobiomythography & Gallery (BAP). He is the publisher and managing editor of Brooklyn Arts Press, serves as the poetry editor for the arts magazine Hyperallergic and small press editor for Boog City, and is the founder of the services-oriented activist group Brooklyn Artists Helping. His piece “Ode to the MQ-9 Reaper,” a hybrid work about drones, was excerpted and praised in The New York Times. In 2015 Joe participated in the Lower Manhattan Cultural Council’s Process Space artist residency program on Governors Island. Joe attended the Iowa Writers’ Workshop, grew up along the Space Coast of Florida, and now lives in Williamsburg, Brooklyn. Frances Justine Post is the recipient of the “Discovery” / Boston Review Poetry Prize, the Inprint Paul Verlaine Poetry Prize, and the Amy Award from Poets & Writers. Her poems have appeared in American Letters & Commentary, Boston Review, Denver Quarterly, The Kenyon Review Online, The Massachusetts Review, Pleiades, Western Humanities Review, and others. Originally from Sullivan’s Island, SC, she received her MFA from Columbia University and her PhD in Creative Writing from the University of Houston. She lives in the Hudson Valley of NY. Kate Angus is a founding editor of Augury Books. Her poetry and nonfiction have appeared in a number of literary journals and anthologies, including Indiana Review, Subtropics, Court Green, Verse Daily, The Awl, The Rumpus, Best New Poets 2 and Best New Poets 2014. She is a recipient of the “Orlando” prize from the A Room of Her Own Foundation, as well as Southeastern Review’s Narrative Nonfiction prize and American Literary Review’s award for Creative Nonfiction. A former Writer in Residence at Interlochen Arts Academy, she has also received residencies from the Writer’s Room at the Betsy Hotel in South Beach, the Wildfjords trail in Westfjords, Iceland, and the BAU Institute in Otranto, Italy. She is a Creative Writing Advisory Board Member for the Mayapple Center for Arts and Humanities and a Guest Literary Arts Curator for the nonprofit arts organization Pen and Brush, where she curates the “Pen and Brush Presents…” reading series. Her collection, So Late to the Party, is forthcoming in Spring 2016 from Negative Capability Press.